This guest post is by David S. Guion, Executive Director of the Dublin Arts Council. Have you ever dreamt of flying? 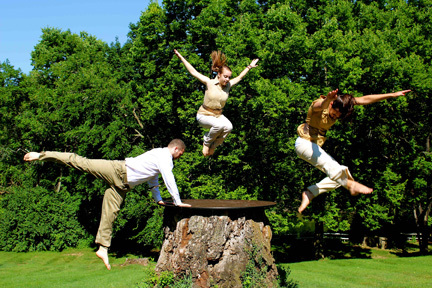 This fascination with flying has helped inspire choreographer Keely Shaffer-Glenn to create Gravity’s Ripple III, a site-specific dance performance on the sloping riverfront grounds of Dublin Arts Council. 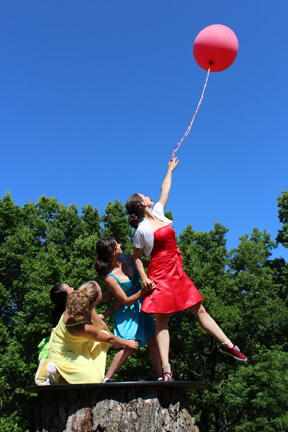 Keely’s talented and agile dancers will incorporate balloons and paper airplanes as they encourage the audience to come along for the ride. Challenging the slope of the hill and the weight of gravity, the dancers will guide the audience through journeys of flight and fancy. All are welcome to experience a dress rehearsal on Friday, Sept. 16 at 11 a.m. at Dublin Arts Council, 7125 Riverside Dr., in Dublin. Dancers and non-dancers of all ages are encouraged to attend. We encourage young children and their families to picnic on the grounds after the performance and enjoy the scenery. You’re also invited to two free performances of this original work, Friday Sept. 16 and Saturday Sept. 17 at 6:30 p.m. at Dublin Arts Council. The performance is approximately 40 minutes in length and will be followed by a Q&A session with the choreographer and the dancers. Sunset and nature will surely play a feature role in the performance. Gravity’s Ripple was first presented in 2009, and continues to receive supportive audience feedback. Most people have never attended a contemporary dance performance before – and certainly not outside. Their enthusiasm has encouraged us to continue this unique project. The project is offered free of charge through an array of collaborations and financial supporters. Gravity’s Ripple III is presented by Dublin Arts Council and OhioDance in collaboration with The Ohio State University Department of Dance and Ohio Department of Education Division of the Arts with additional support provided by Ohio Arts Council and the Target Foundation.